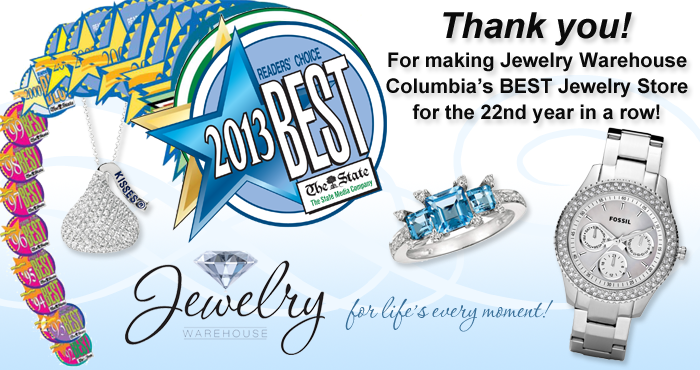 Once again you picked Jewelry Warehouse as Columbia’s Best Jewelry Store in the Reader’s Choice Best of 2013! This is the 22nd year you have chosen us as your favorite place to shop for Jewelry! We really appreciate it! Thank you to everyone that voted for us! This entry was posted in Jewelry, Jewelry News and tagged best jewelry store in columbia sc, best of columbia, columbia sc jewelry stores, jewelry in south carolina, jewelry warehouse. Bookmark the permalink.